A resident whose residence has been within the public for-fee parking area according to the Estonian Population Register for at least two months immediately preceding the filing of the application, whose residence is within the public for-fee parking area according to the Estonian Population Register at the time of the filing of the application, and whose name is indicated as the owner, user or authorised user on the registration certificate of the vehicle, is entitled to the resident's charge concession for parking a category B passenger car or category AM four-wheel motor vehicle in the parking zone corresponding to the location of her/his residence. A resident shall pay for parking € 120 a year. 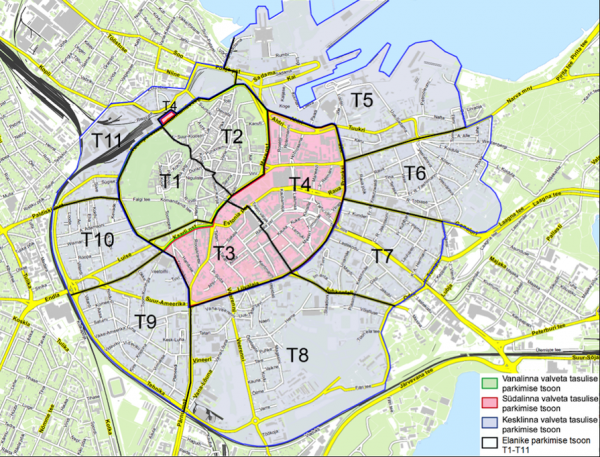 In the City Centre zone, the exemption from the parking charge applies to drivers whose vehicles produce zero grams of pollutants per kilometre from carbon dioxide emissions. Exemption from the parking charge applies to a mobility-disabled driver and a driver servicing a mobility-disabled or blind person if holding a parking card compliant with the standard format set by the Minister of Social Affairs.